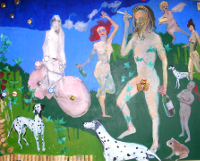 Please click on an icon below to open the relevant pages featuring poems and paintings from collections and other projects. 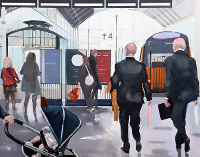 Hull Cityscapes Project Project undertaken as part of the Professional Practice programme at Hull College Faculty of Art and Design: a series of large oil paintings to be accompanied by poems.The paintings have been exhibited at Hull Central Library as part of the Hull to Iceland and Back event commissioned for the Humber Mouth Literature Festival, October 2018. Another exhibition was hosted by Smailes Goldie, at their Hull offices from November 2017 to mid February 2018. Life studies Selection of recent life studies.